Dartek Cast Nylon Film is a soft, transparent, nylon film with no plasticizers, additives or surface coatings. It is often used as a covering membrane for lining of paintings on a vacuum hot table or low pressure table. When used in a heated setting it becomes softer and more conforming. 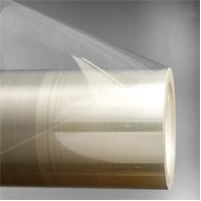 Dartek Cast Nylon Film is 0.75 mil thick, 88" wide and 200' in length.